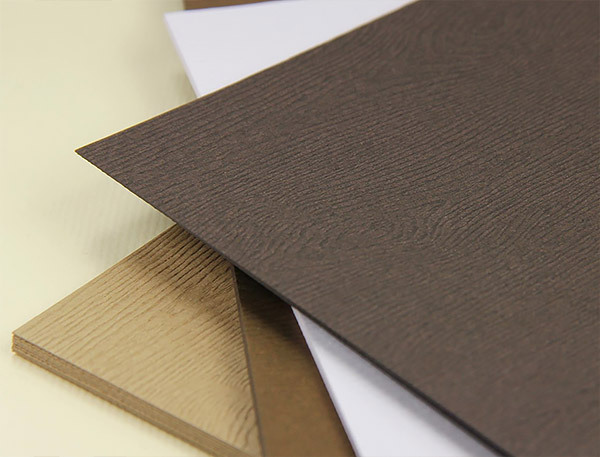 Woodgrain paper - eight colors, three collections, one rich, remarkable texture - it's a must see, must touch, must have. Expertly crafted by world renowned Gmund Paper in Germany, it is made from chlorine free cellulose, is pH neutral, and fade resistant - superior sheets that stand the test of time. Gmund's wood grain texture captures the character of real wood, knots and all. 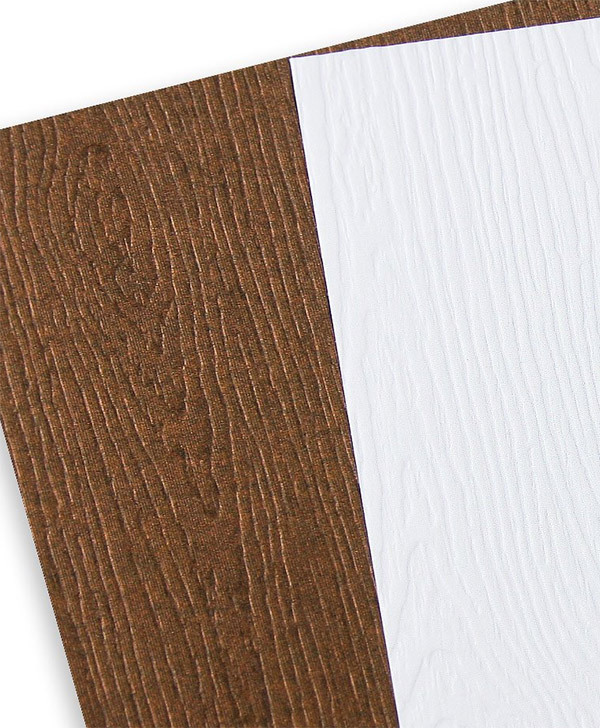 This distinct wood grain texture comes from a heavy embossing on one side of the sheet. The reverse side is mostly smooth, though has subtle wood grain markings that come through during embossing. Wood grain paper is offered in a 21lb translucent, a 68lb text, and a variety of cover weights. Choose from a variety of popular pre-cut sizes in each. Matching wood texture envelopes are available for Tindalo, Bubinga and Limba. Matte finish Gmund Color System envelopes are also available for each color. Question: i want to know if your woodgrain cardstock is woodgrain on both sides of the paper or just one side? Answer: The Woodgrain Cardstock is textured on one side and is matte smooth on the other. Question: We are interested in the look of Tinaldo woodgrain cardstock to use as flat place cards at my daughter's wedding. Is it possible to have LCI print flat place cards on Tinaldo cardstock? 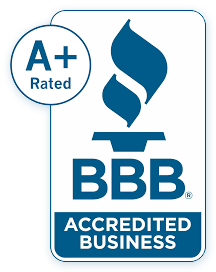 Answer: We are not able to print on the wood grain card stock. The woodgrain is a very textured card stock and our printers do not handle them well. 21lb Frozen Limba is elegant, translucent, lightweight and sheer perfect for overlays, wraps, bands, envelope liners, and more. Light weight, flexible wood grain 68lb text weight paper available in 3 colors. 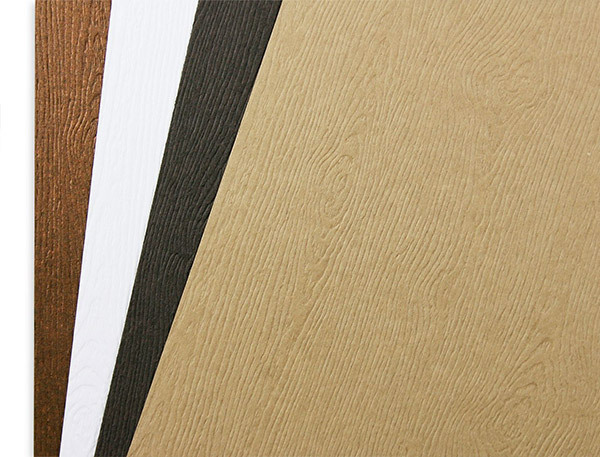 Wood grain card stock is thick, heavily embossed and available in 8 colors. Shown from left to right: Glowing Makassar, Tindalo, Limba, Bubinga, Brasilia Powder, Brasilia Dust, Brasilia Black & Brasilia Grey.